Remove the stems from the mushrooms. Chop the removed stems finely and set aside. Toss the mushroom caps in a bowl with the olive oil, and set aside. Add the sausages to the skillet and cook for 8 to 10 minutes, while breaking them apart into tiny pieces with a wooden spoon. Add the chopped mushroom stems, onion, bell pepper, and garlic to the sausages, and cook for another 5 minutes. Add the almond meal and stir until well combined with the other ingredients. Remove from the heat. Add the parsley; give it a good stir, and season to taste with salt and pepper. Fill each mushroom cap with a generous amount of the sausage mixture. 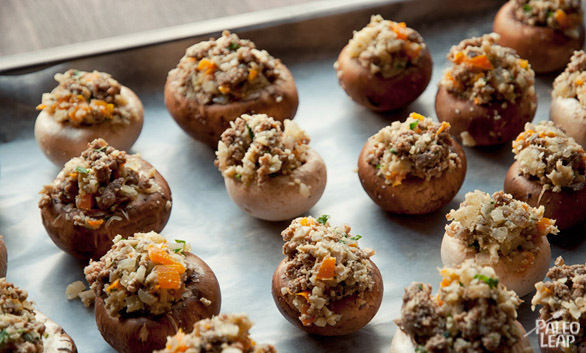 Line all the stuffed mushrooms on a baking sheet, and place in the oven. Cook for about 40 minutes or until the stuffing is browned and crusty. MAKES: 20 PREP: 15 min. COOK: 1h.